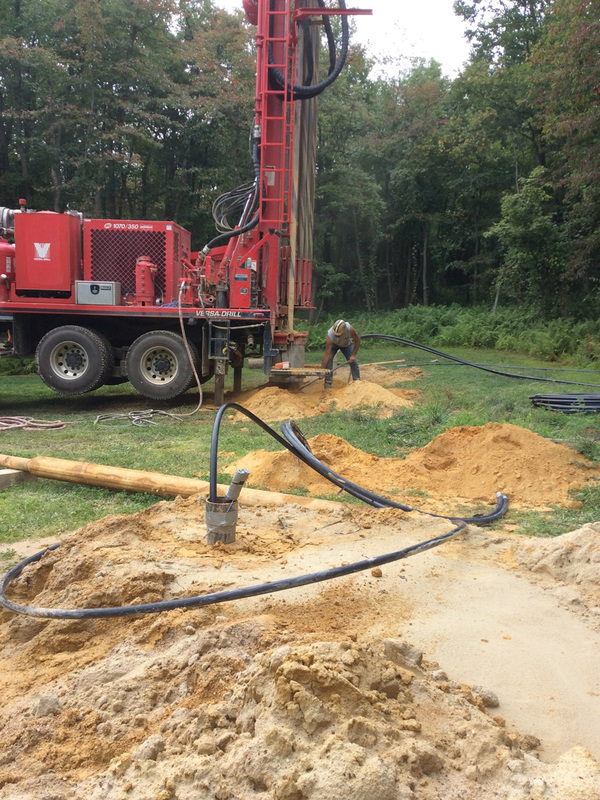 Geothermal - Kocher's Water Pumps & Tanks Inc.
We are proud to offer geothermal loop field installation services to area homeowners and contractors, including thermal conductivity testing and drilling test bore holes for commercial work or large residential projects. Expanding the business in 2004, Jake attended Oklahoma State University (IGSHPA) where he completed his training for the design and installation of ground source pump systems. As accredited installers we are also certified heat fusion technicians. Being one of the first companies in the area to become IGSHPA certified has given us the advantage of having the most experience in the design and installation of geothermal systems. Because of our expertise in the geothermal industry numerous HVAC companies consult with us on the design and installations of their projects. As the geothermal industry expands we are always continuing our education through training and seminars. We use ball locators to mark the position of a geothermal well. This allows someone to quickly locate them in the future to avoid any damage while digging. Learn more about 3M EMS Electronic Markers. We flush and balance all residential and small commercial closed loop systems for maximum efficiency. Savings- Geothermal systems can cut your home or business heating and cooling costs by 50 percent and provide hot water free or at a substantial savings. Durability- Geothermal systems last longer than conventional systems because they are protected from harsh outdoor weather. The heat pump unit is housed indoors and the loop is underground. Cleanliness- Geothermal systems work toward the preservation of the environment by minimizing present environmental problems like acid rain, air pollution, and the destruction of the ozone layer. Low Noise- Geothermal systems have no exposed, noisy, outside units. The unit operates quietly to satisfy your needs without disturbing you or your neighbors. Conservation- Geothermal systems work with the environment by using the earth’s moderate ground temperature to heat your home or business in the winter and to cool it in the summer. Flexibility- Geothermal systems can be adapted for residential, institutional, and commercial buildings anywhere. They can be placed in both new buildings or used for retrofits of existing buildings. Health- Geothermal systems don’t rely on outside air. They keep indoor air cleaner and free of pollens, outdoor pollutants, mold spores, and other allergens. If indoor air quality is a priority to you, consider Geothermal. We now provide service of Geothermal Units and Thermal Conductivity testing.